A moving company must be part of an arbitration program to move customers. The arbitration program must be clearly stated within the contract of the mover. They must make it clear to their customers that they are part of an arbitration program. Their customers are free to use that program to file a claim against the moving company, if needed. There may also be rules included in the contract that allow the customer to solve the dispute directly with the moving company. If they are not able to, then a moving arbitration program is available. It is a good idea to have programs reviewed by a professional dealing with moving arbitration. Many providers of arbitration programs check your moving contract for a fee. This will help you in the long run if you were to be audited by the Department of Transportation. It is important that your arbitration stay up to date on your contracts. 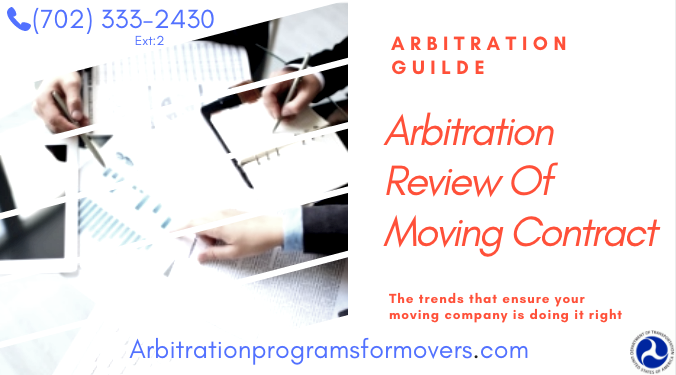 Many moving companies like to change arbitration programs from year to year. They explore other arbitration programs every now and then. However, some forget to change the provider of their arbitration program on their contract. This may lead to problems with the USDOT when it is reviewed by them. You may also go over the process of arbitration within the contract. It must be clear to the customer. Having this in your moving contract makes your company more attractive to customers. They feel they have insurance if something were to go wrong with a move. If you would like to set up arbitration, give us a call. We provide one of the best arbitration programs in the United States. Our employees ensure that your contract properly displays its information on arbitration. We check to make sure your arbitration provider is a legitimate provider. We also check to see that everything listed in your contract regarding arbitration is legal. It is our goal to make sure that all movers are following the laws regarding movers arbitration. This is our effort to keep the industry fair. If you are still looking for a moving arbitration program provider, we provide that service for a fee of $185 a year. By choosing us, we guarantee the most experienced and professional arbitrators in the moving industry. We guarantee your satisfaction with your purchase when it comes time to put your arbitration program to use. Call us now to begin!